We loved the "chocolate skin" that was produced after chilling them in the fridge. We ate them like there was no tomorrow. So, billk... How'd it go with the pudding? Was it as you remembered? I drove over to the Safeway in Corte Madera, and sure enough, hidden in the international/Kosher food section was My-T-Fine chocolate pudding. I bought 4 boxes, and will make my Dad's dessert in the next few weeks. A quick web search shows that My-T-Fine is still being made by the the Jel-Sert company. In fact their web site claims that the Safeway in Corte Madera carries them. This is worth investigating! They still had them in NJ a few years back. Yum! Especially the chocolate instant. This was our favorite brand - my Dad used it all the time. I'll hae to ask him if it's still available back in Massachusetts. My Grandfather worked for Maxwell House Coffee factory in Hoboken ,NJ. during the late 50's early 60's . 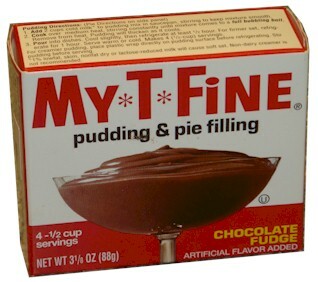 They also produced "My-T-Fine" puddings and I think Lipton Iced Tea. Needless to say ,we got our fill of both. Anyone who lived in Hoboken in those days will remember the smell of Coffee that wafted over the City. Great memories.